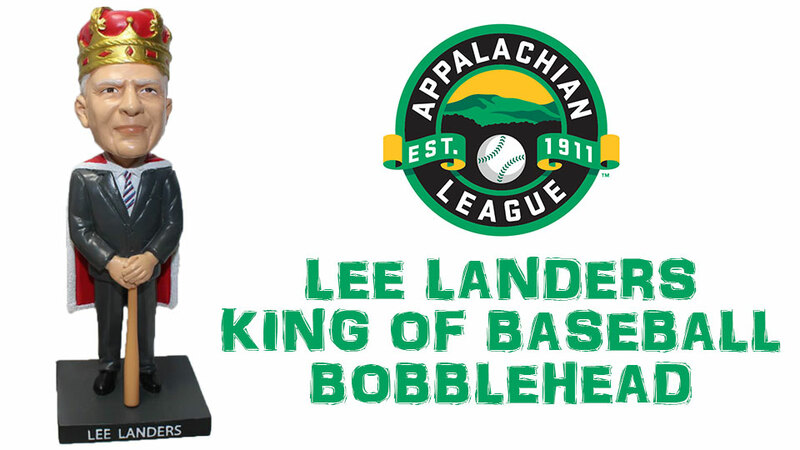 REDINGTON SHORES, Fla. - The Appalachian League today announced plans for a Lee Landers bobblehead giveaway during the 2018 season. Nine teams in the Advanced-Rookie league will participate in the promotion to honor League President Lee Landers, who will retire following the 2018 season. "Lee has meant so much to the Appy League that we as a league wanted to come up with a way to collectively thank him," said Burlington Royals General Manager Mikie Morrison, who came up with the idea for the bobblehead following Landers' retirement announcement this past winter. Landers was named the 2017 King of Baseball, and his bobblehead likeness will feature the crown and robe presented to him at the Baseball Winter Meetings in Orlando, Fla. in December. "Bobbleheads and Minor League Baseball go hand in hand, so deciding to do one that featured Lee as the King of Baseball seemed like a great way to commemorate him. Lee is going to be greatly missed, and I'm honored to have worked under his leadership," Morrison said. "I am humbled and honored that the League would think of doing this on my behalf," said Landers, who has served as Appalachian League President since 1996 as part of a career in professional baseball that began in 1959. Bluefield, Bristol, Burlington, Danville, Elizabethton, Greeneville, Johnson City, Kingsport, and Pulaski will all participate in the promotion, hosting the bobblehead giveaways on dates coinciding with Landers' trips to each ballpark during the 2018 season. Tickets will be available through each individual team.